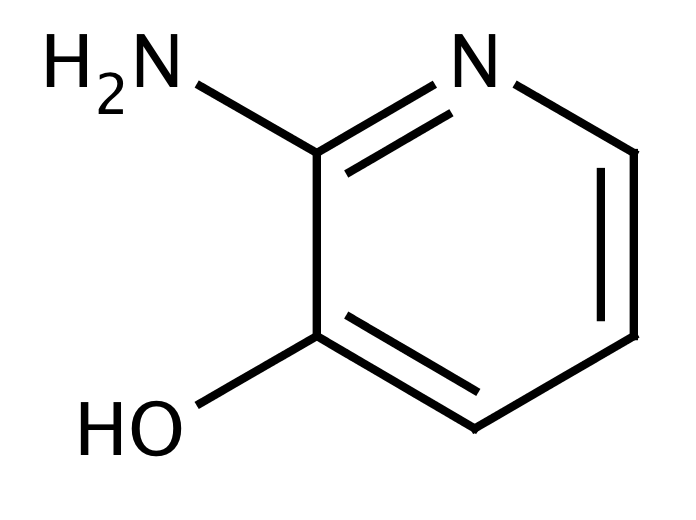 2-Amino-3-hydroxypyridine was used as reagent in reaction of dimethyl acetylenedicarboxylate and triphenylphosphine to yield functionalized coumarins and 1,4-oxazines. 2-Amino-3-hydroxypyridine forms complexes with number of transition metals. It inhibits the corrosion of aluminium and copper in acidic solutions. It undergoes condensation with 2-hydroxy-1-naphthaldehyde and 2-hydroxybenzaldehyde to form Schiffs bases. It is useful in the preparation of clinical anti-inflammatory analgesics. Send us your enquiry for 2-Amino-3-Hydroxypyridine. We offer custom pack sizes at special prices. We aim to respond to your enquiry within 24 hours. We value your input so if you have suggestions regarding new applications for 2-Amino-3-Hydroxypyridine email us and we will include your contribution on the website.